After more than three months at the bottom of the Mississippi River in New Orleans, La., the mv. Natalie Jean was raised June 21 near the New Orleans General Anchorage, across the river from the Chalmette Battlefield. 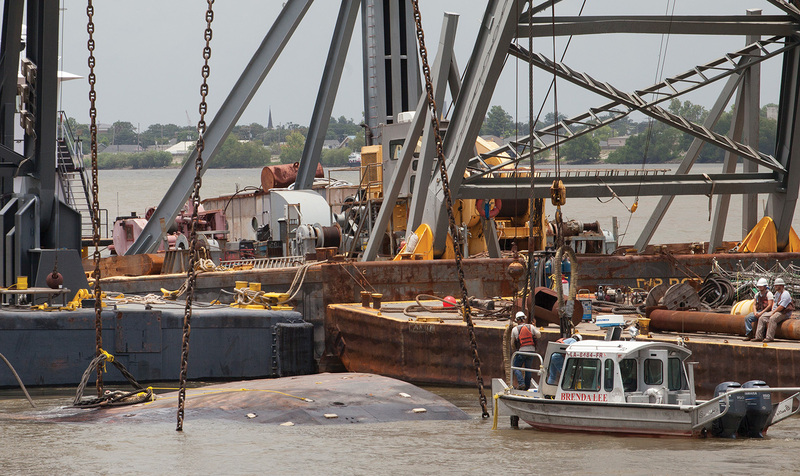 McKinney Salvage & Heavy Lift Inc. led the effort to raise the vessel, first hauling the Natalie Jean hull up, from near the middle of the river to the west bank, then righting the vessel and pulling it from the river. The Natalie Jean, owned by Harvey, La.-based Creole Chief Towing, sank March 12 when the Mississippi River in New Orleans was at flood stage and flowing at near 1.25 million cubic feet per second. The current pushed the vessel into a ship’s anchor chain, capsizing the Natalie Jean. One crew member was rescued, while two others, later identified as Malon Dawsey and Karl Prince, were missing and presumed dead. The bodies of Dawsey and Prince were recovered from the towboat the day it was raised. The U.S. Coast Guard had long been aware of the Natalie Jean’s location, but high river levels and powerful currents prevented salvage efforts until mid June. The March high water period on the Mississippi River in Southeast Louisiana saw at least three incidents where towboats encountered anchor chains or ships at anchor. One other towboat capsized, while the third was able to drive off the anchored ship. There were no other casualties.